(Beijing, 11 May 2013.) An exhibition of paintings of naive artists from Kovačica, Janoš Mesaroš and Jan Glozik, who attended the ceremony, was held on the 10 May 2013 in the residence of the Ambassador of Slovakia in Beijing. 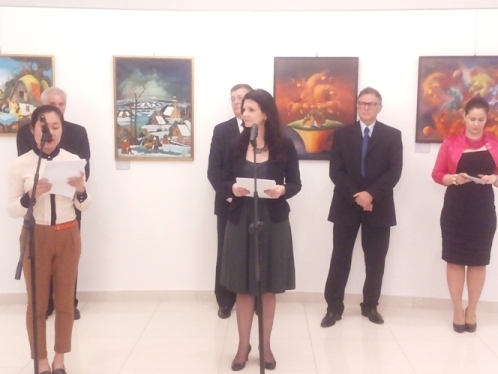 The exhibition was opened by the Ambassador of Slovakia, H.E. F. Dlhopolček and Charge d’ Affaires a.i. of the Embassy of Serbia, T. Panajotović Cvetković. They presented the works of Mesaroš and Glozik and the school and naive painting of Kovačica, which gained worldwide popularity through the presentation of folklore motives of ethnic communities in Vojvodina, as a positive model of a multicultural environment and exchange. The opening ceremony was attended by representatives of the diplomatic corps, the Chinese academic community and members of the Serbian and Slovak diasporas in Beijing.